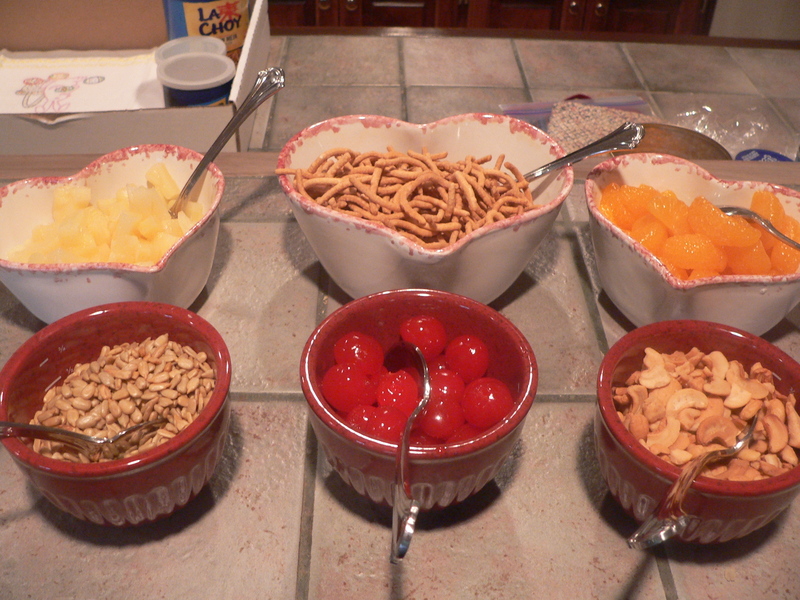 Wind & Willow has so many delicious dessert and cheeseball mixes to choose from. This recipe would have also been good with the Strawberry, Chocolate Chip, Tirimisu or English Toffee mixes. Next, mix the Wind & Willow White Chocolate Amaretto Cheeseball mix, one egg and 8 ounce package of softened cream cheese together. The Beater Blade makes this a SNAP in your Kitchen Aid Mixer. Prepare the mini cake pan good with Pam or Baker's Joy. Fill the batter to about half full. 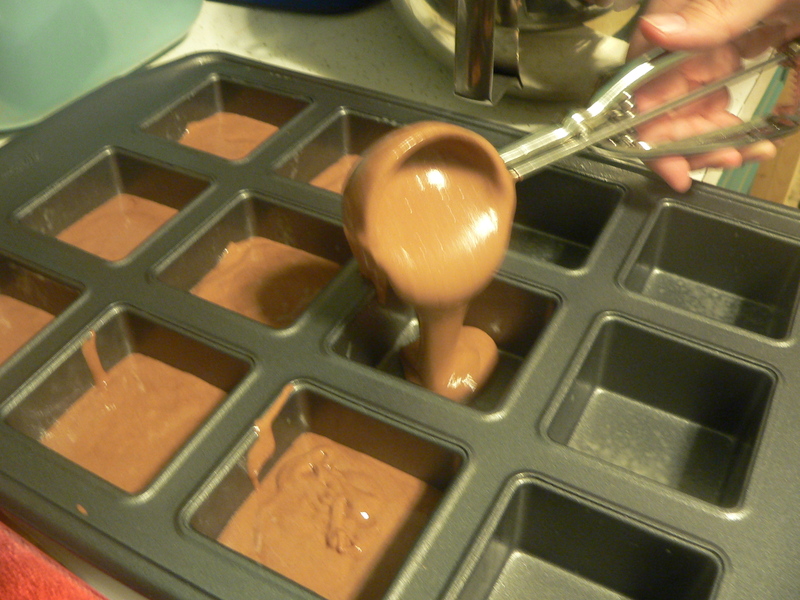 Next fill the mini cake pan with batter. 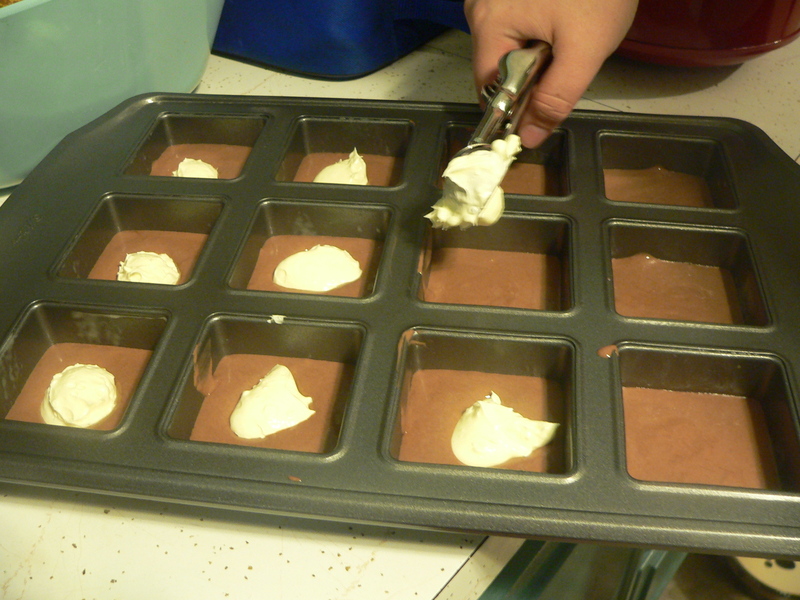 We use an ice cream scoop so that we can measure out the batter evenly. 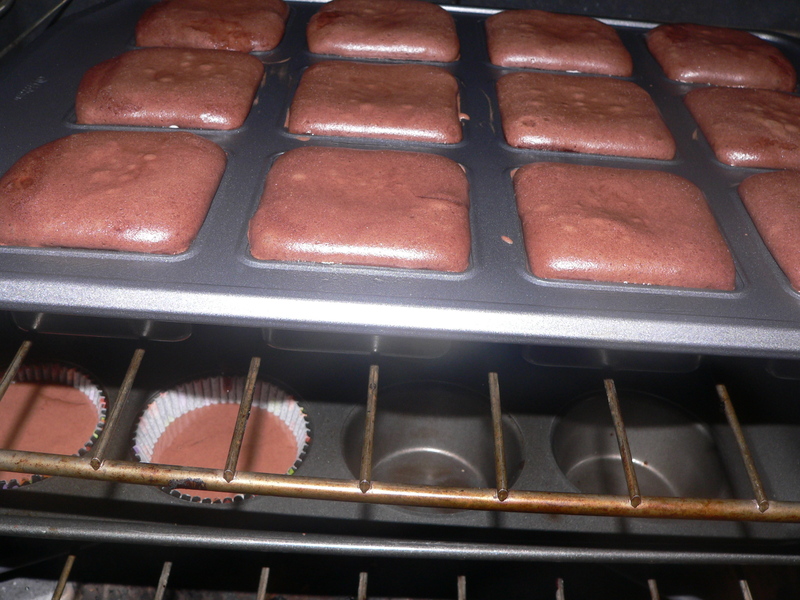 You can also use a regular cup cake pan if you don’t have the square style…they taste just as good! 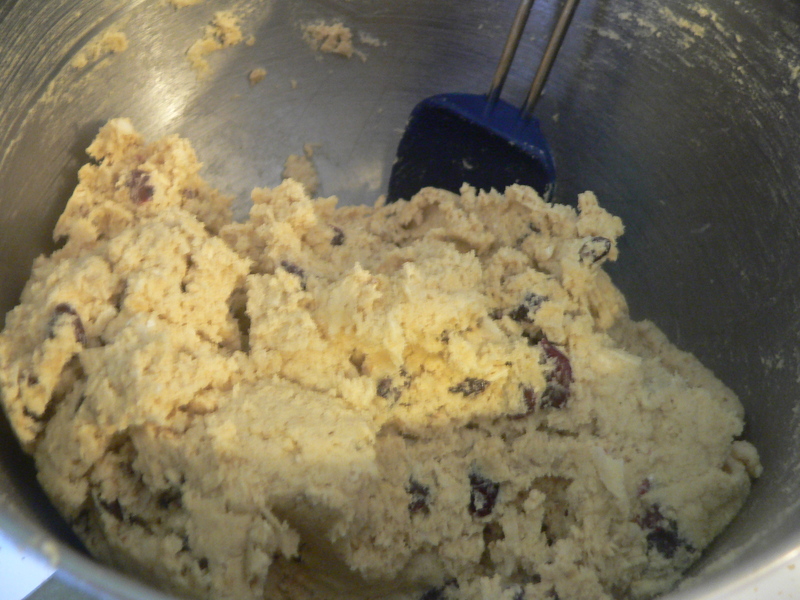 Now we carefully add the cream cheese filling mixture using a smaller cookie scoop. Try to get the filling right in the middle of each little cake for a prettier presentation. 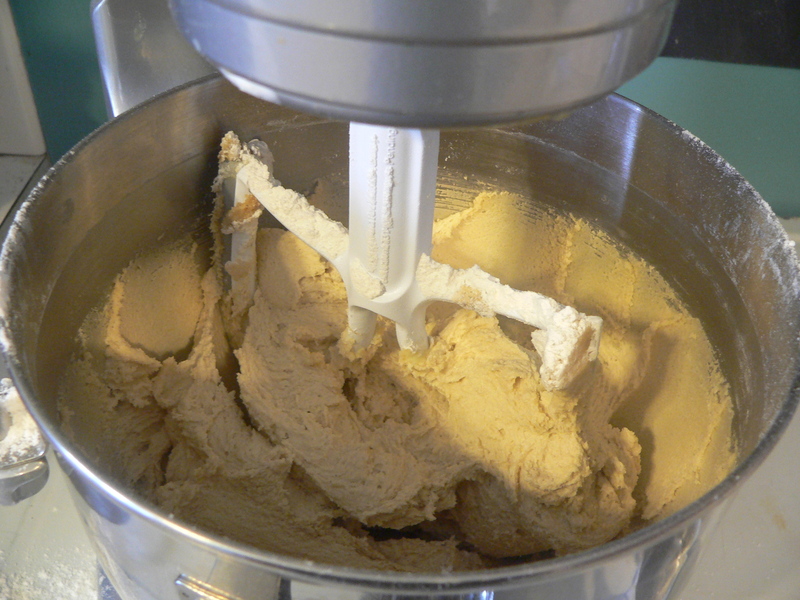 We used a size 24 scoop for this (about 1 Tablespoon size). Top the filling with a little more batter. We actually over filled these a bit, but more about that later! Now they’re ready to pop into the oven. We just had to peek to see how they were doing! I’m so glad that this picture doesn’t show how dirty my oven is right now! I have got to get that done before the weather turns any warmer! Don’t they look pretty? I think this made about 18 total mini cakes. 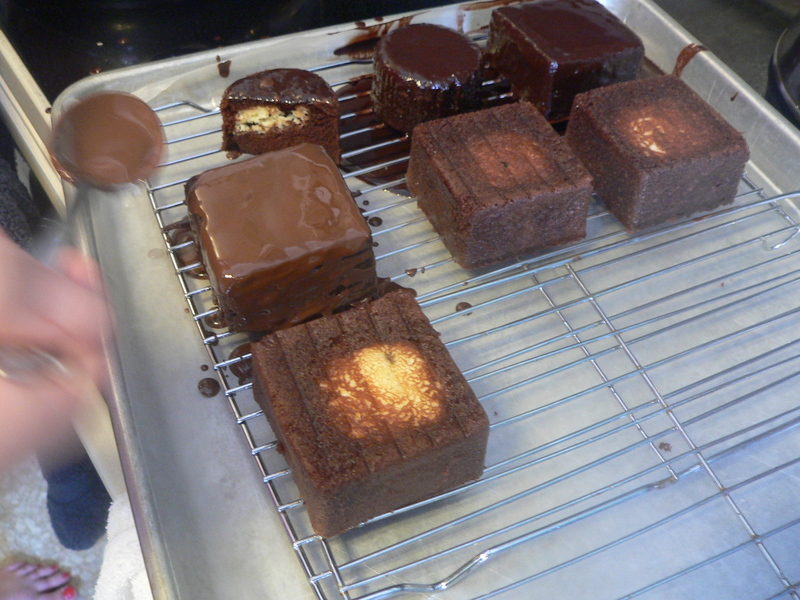 Now cut off the “tops” to make a nice square little mini cake. Set them on a wire rack to frost. 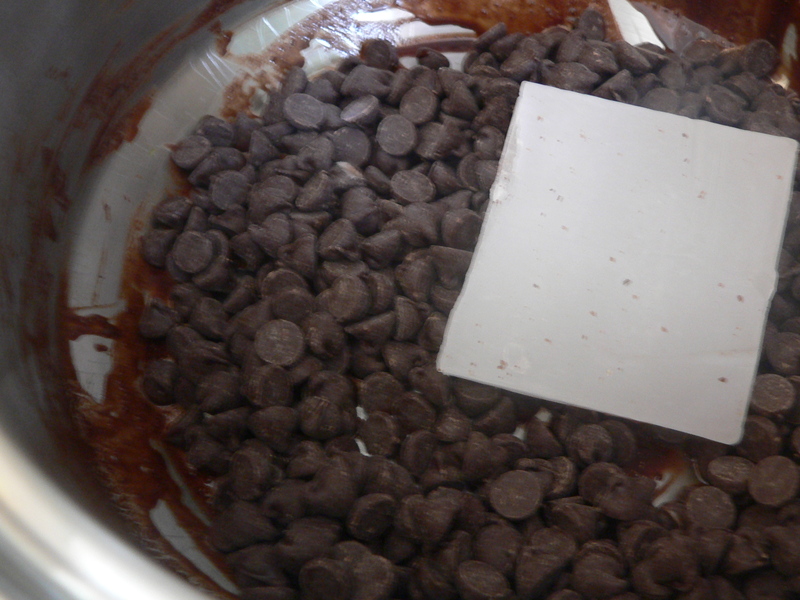 Melt the chocolate chips and paraffin in the top of a double boiler. 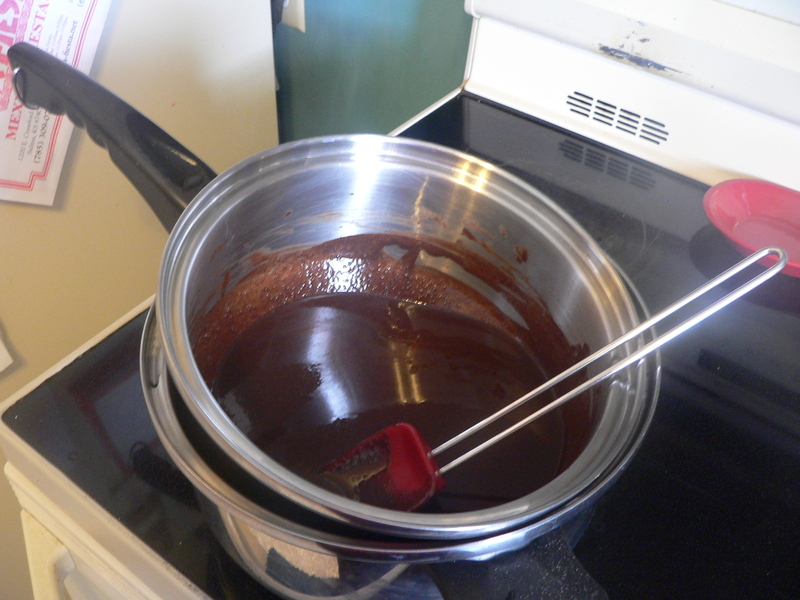 Make the chocolate coating by melting the chocolate chips and paraffin wax in the top of a double boiler. The paraffin gives the chocolate body and gives the finished product a nice shiny finish. Ooohhh...the fragrance from this melting chocolate is just BLISS! The chocolate mixture will be thin. 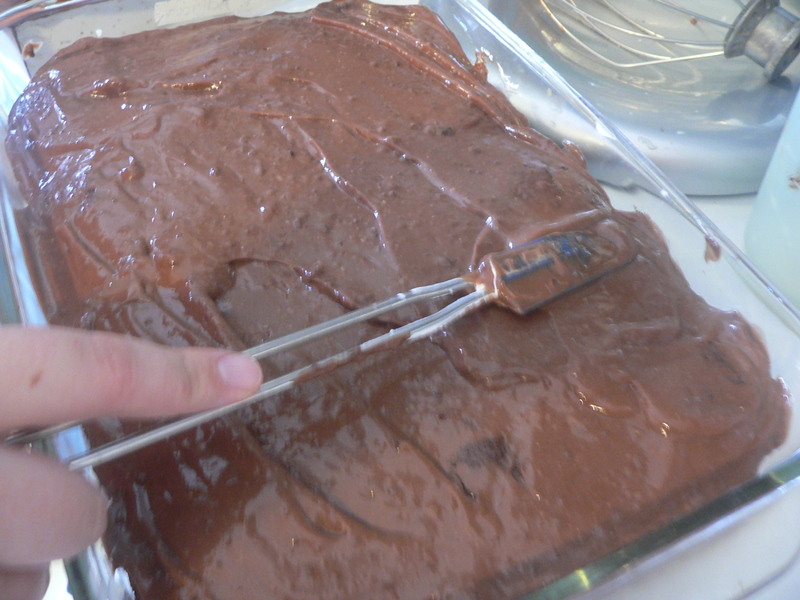 We “frosted” the 4 sides with the back of a spoon, then coated the top of the cakes and let the mixture drip off the sides. Let completely dry…about 20 minutes. 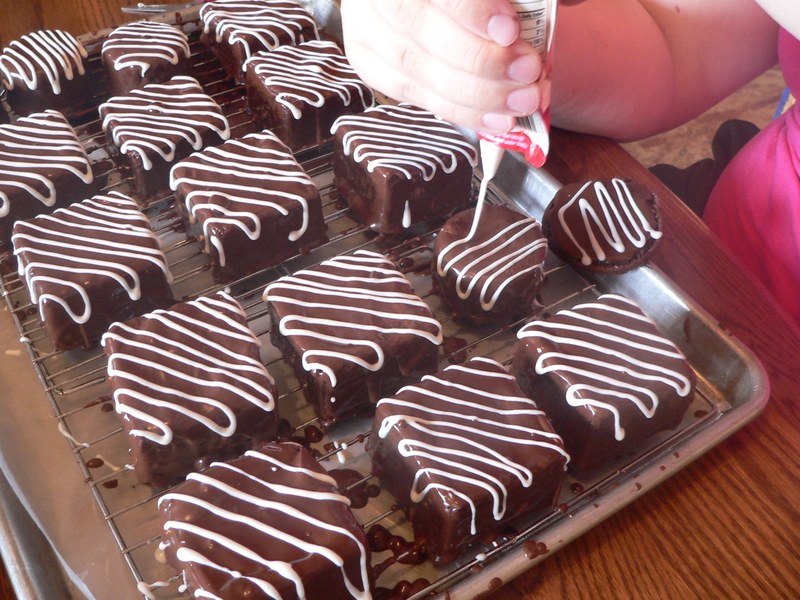 Lastly, Jenny drizzled white chocolate on top…Looks beautiful! Tastes Delicious! 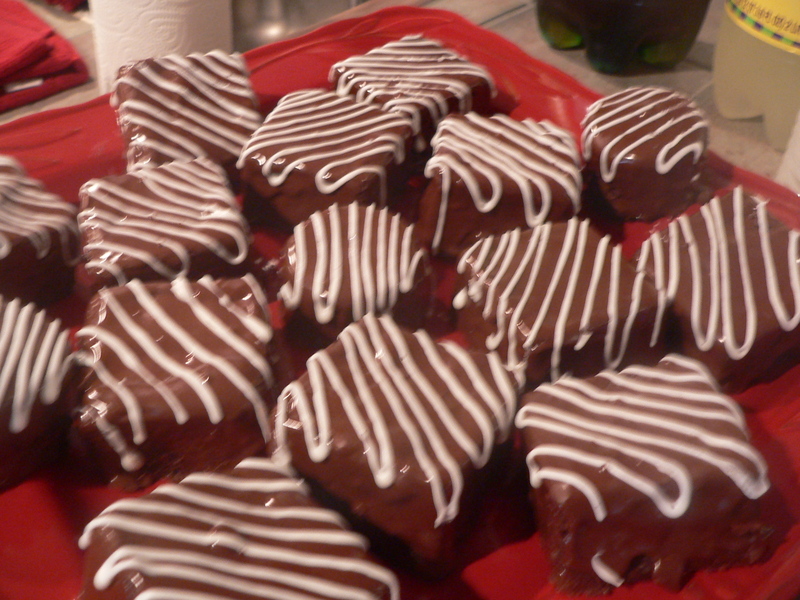 We had a fun, chocolaty afternoon, and I think everyone enjoyed the mini cakes. The White Chocolate Almond filling was a nice surprise inside the cakes. You will want to refrigerate the leftovers to keep them fresh. We were definitely in the mood for chocolate (as always)! 1 white chocolate cupcake topping (by the cake mixes), OR white chocolate for melting for garnish. 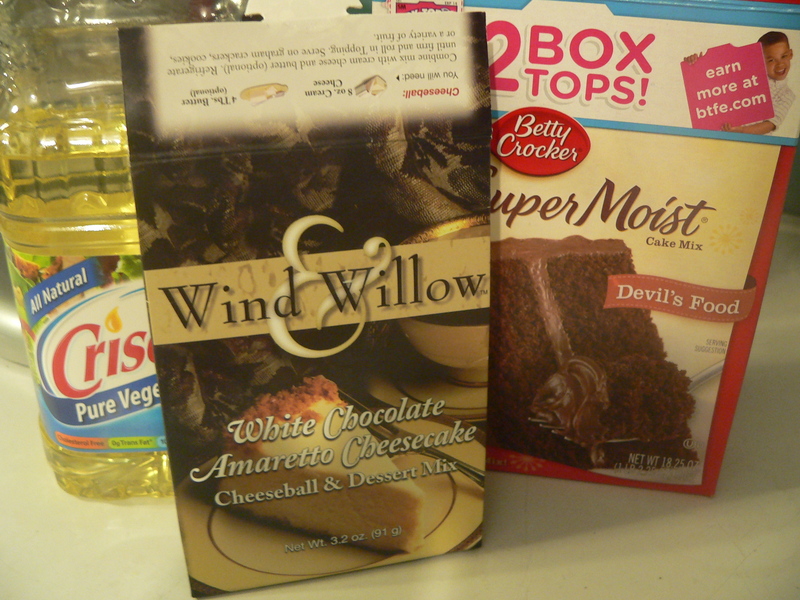 Mix cake mix according to package directions. Set aside. Mix Wind & Willow Dessert Mix with the egg and softened cream cheese. Beat well, then set aside. Fill cupcake pan (either square or round) about 1/3 full with cake batter. Drop tablespoon of cream cheese mixture carefully into the center of each cake. Top with a little more batter. Bake for approximately 20 – 30 minutes at 350 depending on the size of your cupcake pans until toothpick comes out clean. Let cool for about 10 minutes, then remove from pan. Set on a wire rack to cool completely. Cut off the tops of the cakes and reserve for another purpose. Turn top side down. 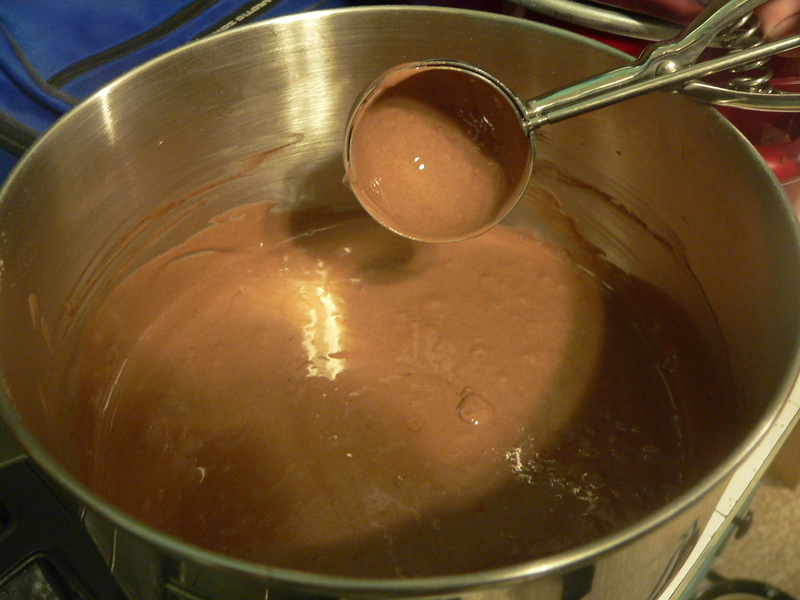 Melt chocolate chips with paraffin wax over boiling water in the top of a double boiler. Now for the messy part: “Frost” the 4 sides of the cakes with the back of a spoon; place on wire rack and coat the top of the cakes with chocolate/wax mixture. The bottom of the cupcake is now the nice flat top of the cakes. This part is messy and fun! Let cool completely, then garnish with white chocolate drizzle. Refrigerate leftovers. Enjoy! Remember the tops that we cut off of the cakes? We decided to use them in another very simple dessert. Garnish with whatever you have available...toffee bits, chocolate chips, etc. The recipe follows, but this one could have a lot of substitutions…truly a “whatever you have available” type of dessert. What’s not to love? We all have chocolate pudding mix in the pantry…you can whip this up in a hurry! 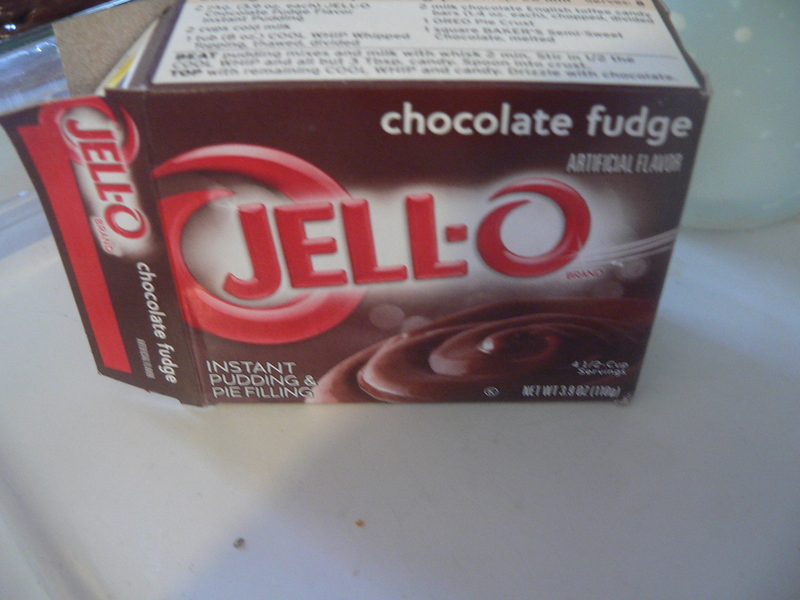 Prepare the first chocolate pudding mix according to package directions; Pour into bottom of a 9 x 13 glass serving dish. Top with 1 container Cool Whip. Add the cake slices, or cupcake tops on top of the cool whip. 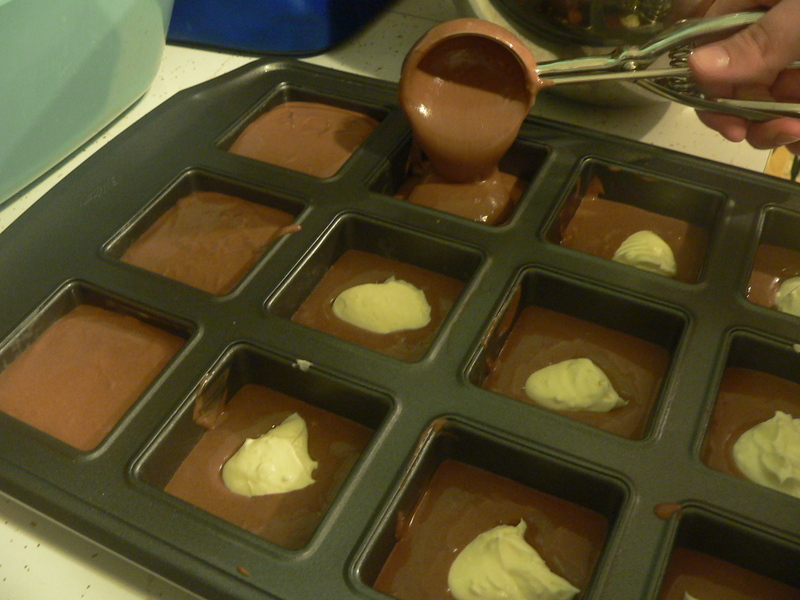 Prepare second package of chocolate pudding. 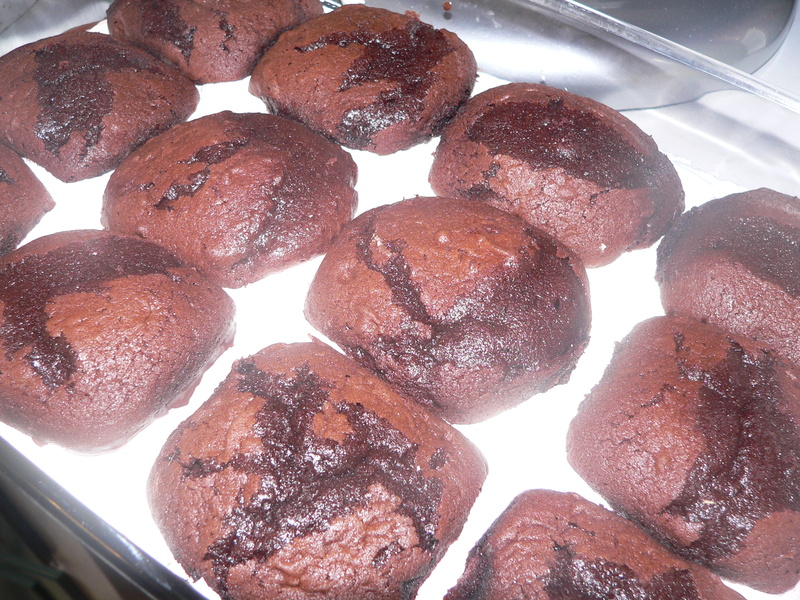 Pour over cupcake tops. Top with another Cool Whip layer. Garnish with shaved chocolate, toffee bits, mini chocolate chips or whatever you have available! No complaints! What’s not to love? Chocolate, Cool Whip, Pudding! This is a delicious dinner that is perfect for serving your family or for a large group. We have actually served 200-300 people this unique dish at special events at Adrians…The really nice thing about it is that it can easily be made ahead and frozen…then when ready to serve, just make some rice, put out the toppings and you’re ready to go! 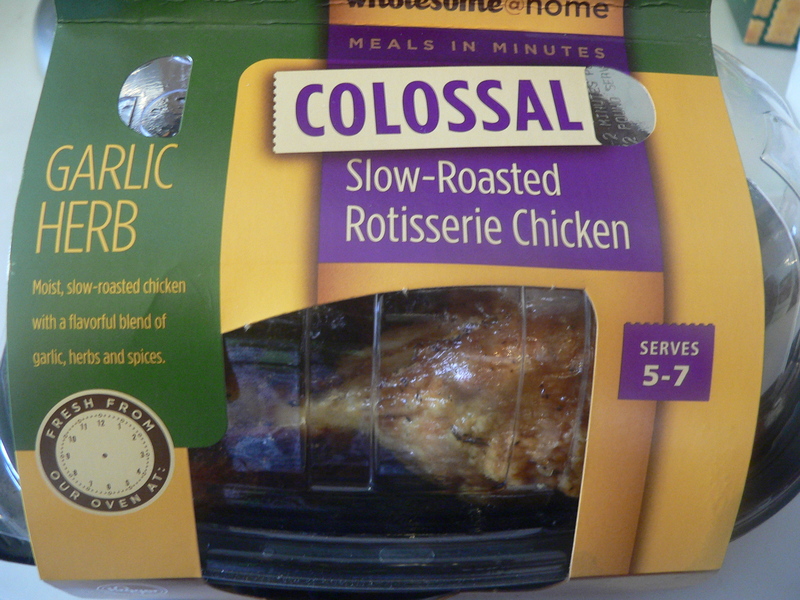 We started with two Rotisserie Chickens for this recipe…it just seems like I am running behind lately, so starting with a rotisserie chicken just saves time. I really do prefer to roast my own chicken! It is so easy to do, but you do have to have TIME to get it roasted! This is a perfect example of why you should roast your own bird! I was pretty disappointed when we pulled this out of the box. It had definitely been in the oven too long! 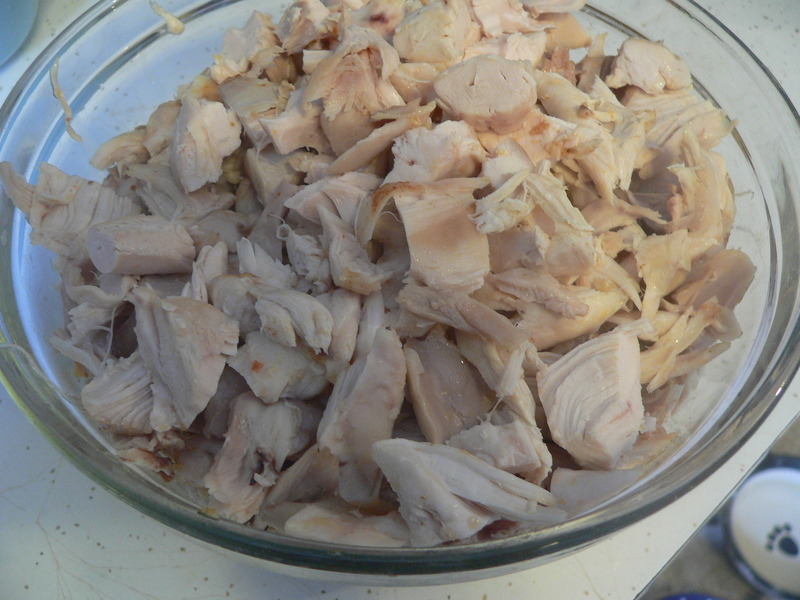 Fortunately, we had two chickens and between the two, got plenty of meat for our Tahitian Chicken…Debone the chicken and save the bones to boil later for some really great chicken broth! Don't forget the crock-pot liners! 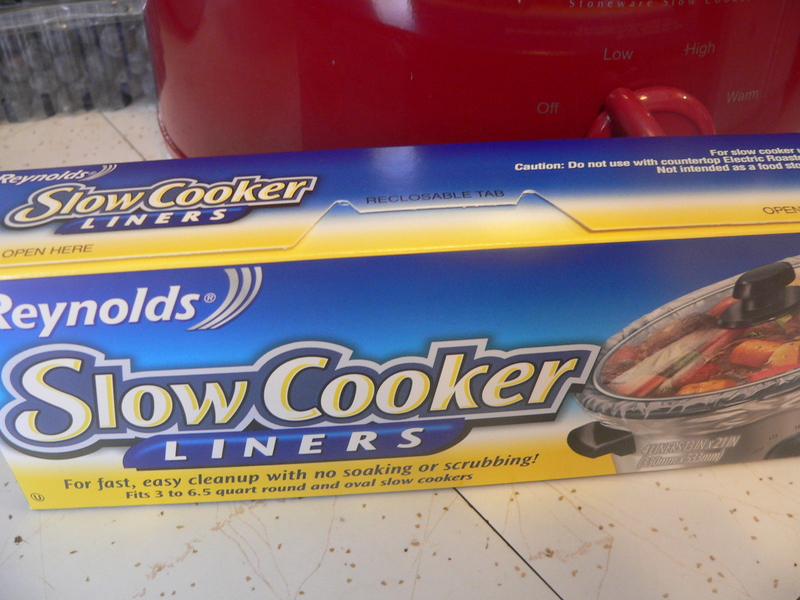 If you’ve followed us for very long, you’ll already know that we LOVE these Slow-Cooker liners from Reynolds. We use them all the time at the store for very easy clean-up. I hate to scrub out a cooked on mess from the crock-pot! You can find them by the ZipLock bags at the grocery store…my kitchen is never without them!!! My photo of the sauce cooking turned out to be just foggy steam…sorry! Just put all of the sauce ingredients into a sauce pan and bring to a boil. Stir constantly and let boil for 2 minutes before pouring over the bite-sized chicken. Let chicken mixture simmer in your (lined) Crock-Pot until ready to serve. I have also frozen the chicken mixture in gallon sized ZipLock freezer bags at this point in the preparation for serving at a later time. A Rice Cooker is one of my favorite kitchen tools (I actually have two of them!). 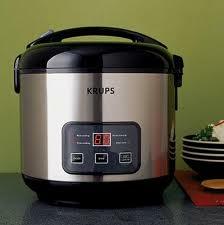 You can prepare rice any way you like for this dish, but I have to say that I love preparing rice in my rice cookers! I have a small one that we use just for our family, and a larger one that I can prepare 10 cups of raw rice which yields over 20 cups of perfectly cooked rice. This is a great buffet line meal…even for just one family. Put the Rice, Chicken mixture and all of the toppings on the counter, and let everyone go through a line and add all of their favorite toppings…choose from Chinese noodles, maraschino cherries, green onions, mandarin oranges, pineapple tidbits, peanuts, cashews, soy sauce, raisins, coconut or ???? Now here is the disappointing part…I FORGOT to take a photo of the dinner as served…so sorry! The good news is that we make this on a pretty regular basis, so I’ll be able to add that later. Again, this is just a great “make ahead” meal for your family or for a crowd. Hope YOU enjoy it as much as we have over the years. cocktail peanuts, cashews, mandarin oranges, sliced green onions, coconut, Chinese noodles, pineapple tidbits, raisins, sunflower seeds, maraschino cherries & ????? use your imagination! 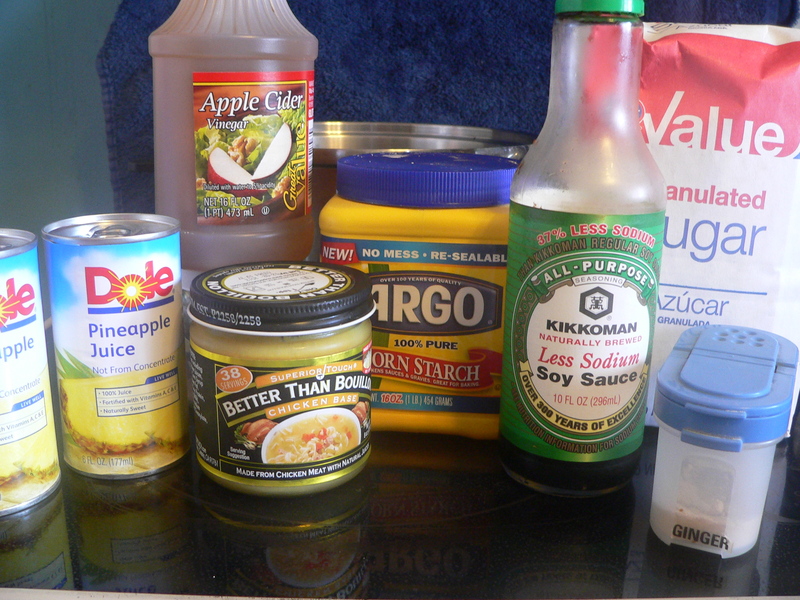 Whisk all of the sauce ingredients together in a saucepan. Bring to a boil, stirring constantly. Boil for 2 minutes. 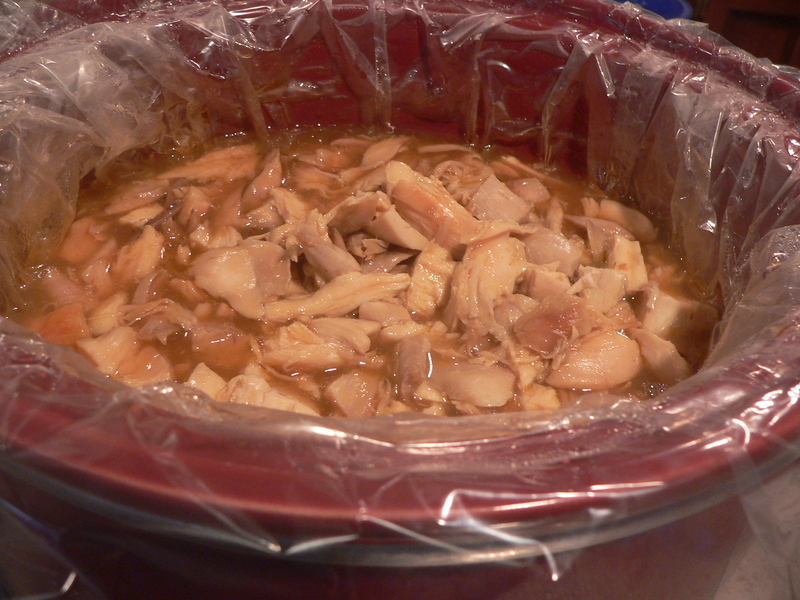 Place crock pot liner in slow cooker. Add chicken and pour sauce over all. Heat and keep warm for serving. Serve over hot rice and let guests top with whatever garnishes they would like. *Note this is such an easy main dish to serve to a crowd and seems to please both men & women alike! 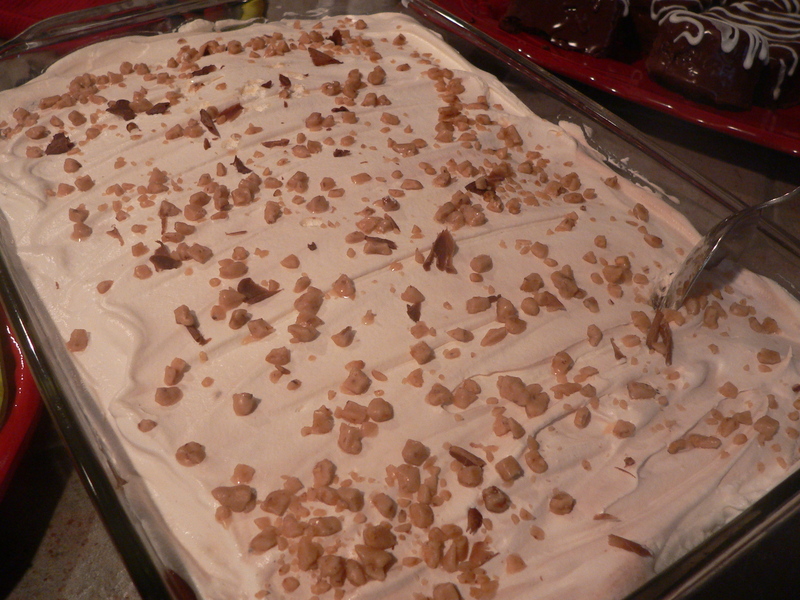 It is an all time favorite that we serve for events at Adrians. Some tips: Prepare chicken and sauce ahead of time and freeze in gallon zip lock freezer bags. These stack really nicely in the freezer. 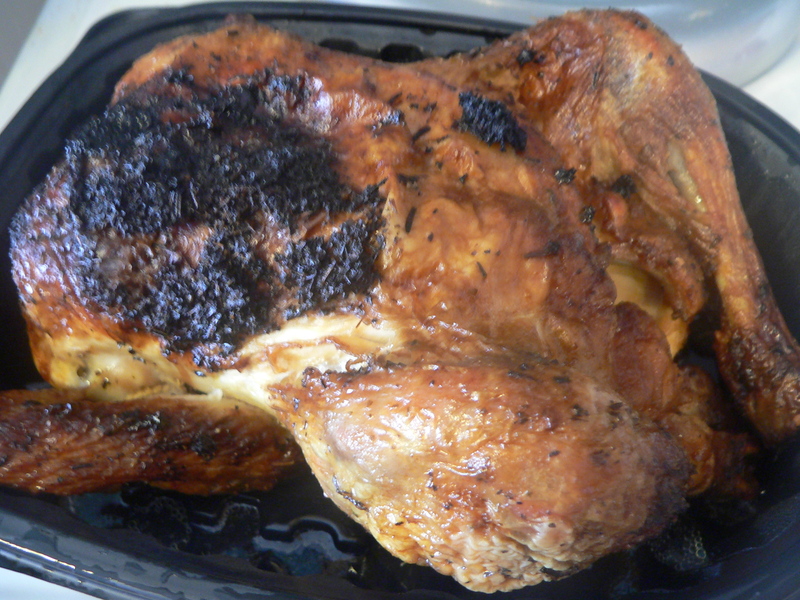 When your party day arrives, thaw chicken, put in crock pot and let heat. 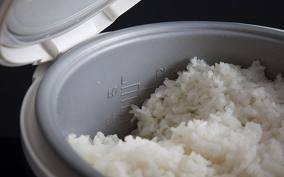 Cook your rice in a rice cooker, then open up the jars & cans of toppings…Very Easy! We LOVE to hear from you! How are YOU using our recipes & ideas? Please leave a comment in the Reply box below. Thanks! Sometimes the most ordinary baking is the clear favorite with your family…We made cookies tonight to take to church for a Children’s Fair next weekend. I find baking to be great relaxation therapy after a busy day! Today my BRAIN hurt…I was in the office all day and was ready for a change of pace when I got home. This recipe comes from Linda Pauls who lives here in Buhler. She is an award winning (many times over) Kansas State Fair Champion Baker, and we are honored to have some of her recipes included in our Adrian’s “Between Friends” Cookbook. 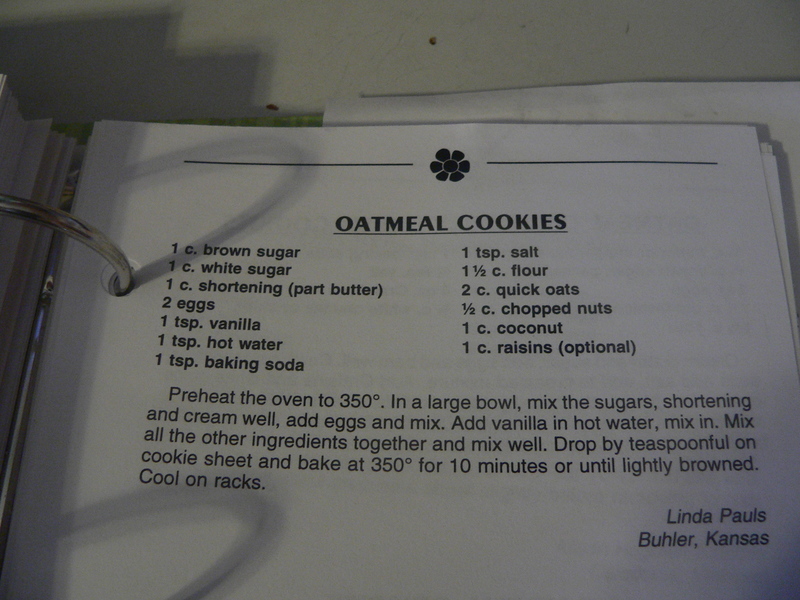 This is her Oatmeal Cookie recipe, and is just pretty tasty! They are crispy on the outside, and nice and soft on the inside. 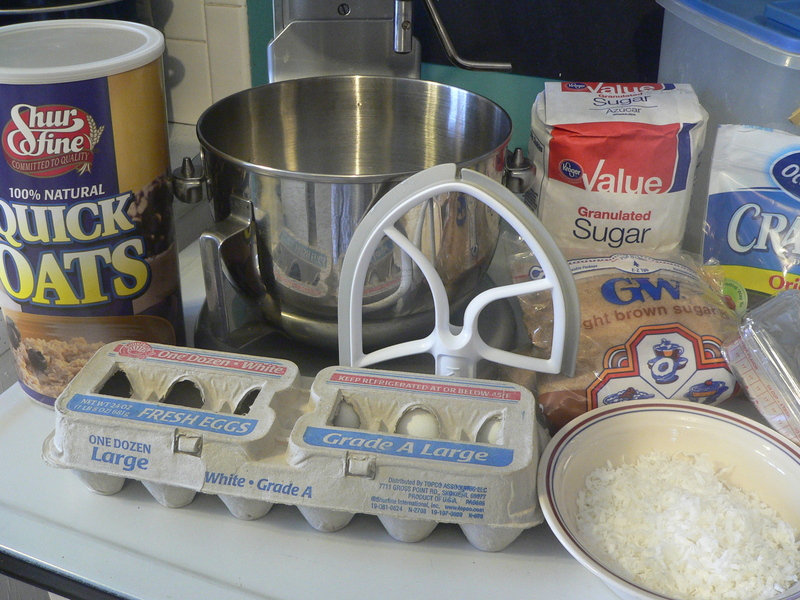 Start with the butter flavored shortening, brown sugar, white sugar & eggs. 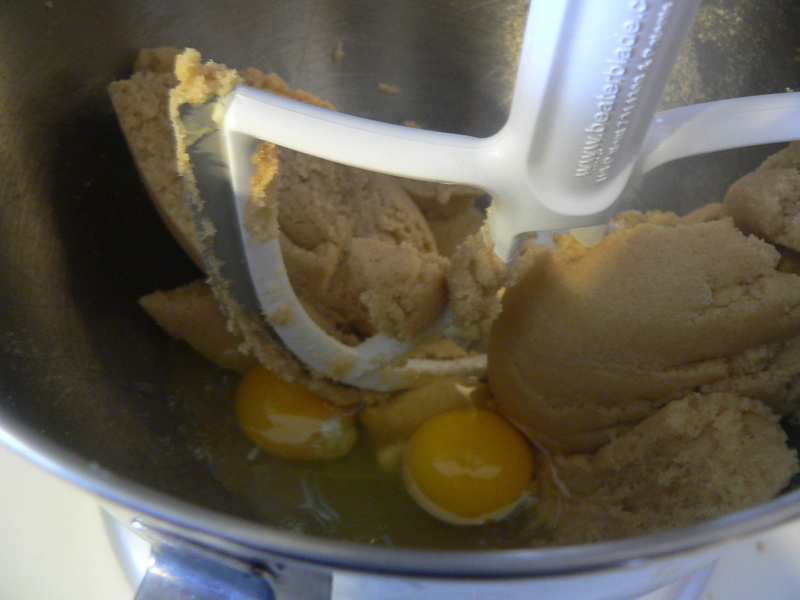 Start by putting the butter flavored Crisco, brown sugar, white sugar and eggs into your mixing bowl. 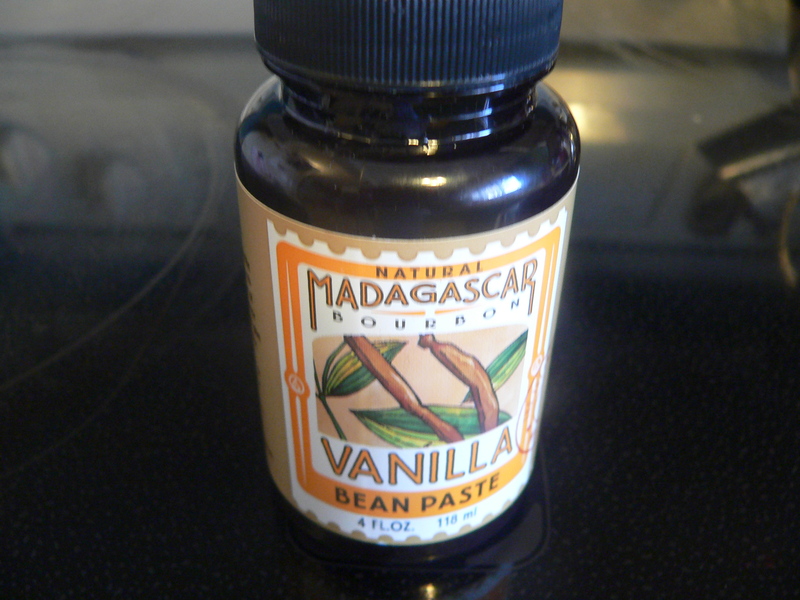 We found this Vanilla Paste and it is heavenly! I use it in place of vanilla extract. Smells amazing! Beat thoroughly...Love my Beater Blade! I love my Beater Blade Replacement Blade for my Kitchen Aid Mixer…It thoroughly cleans the sides and bottom of the bowl. Click to view a great side-by-side Beater Blade Video Demo. 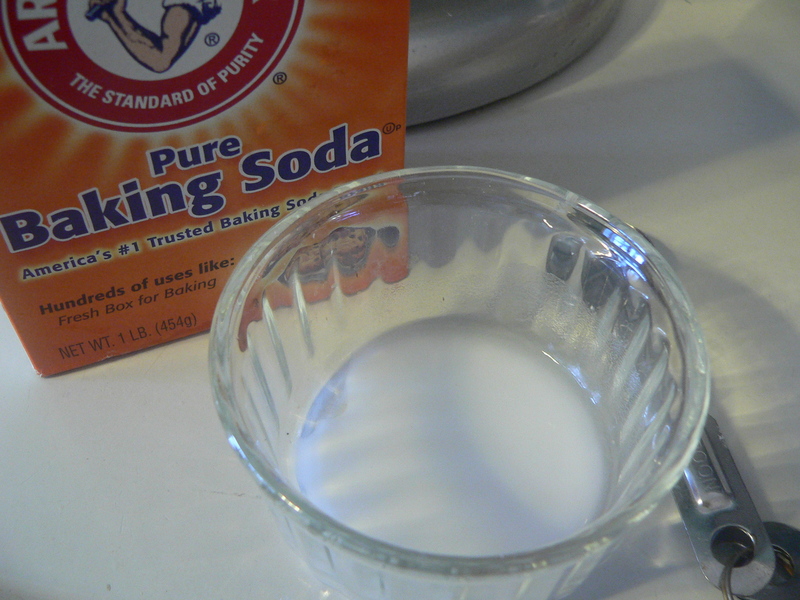 Linda’s recipe calls for dissolving the baking soda in one teaspoon of hot water…what a great idea! I have occasionally bitten into a muffin or cookie and had a clump of baking soda in one bite. Ugh! This solves that problem in a very simple step! I will do this with other recipes as well. Now add the real goodies! 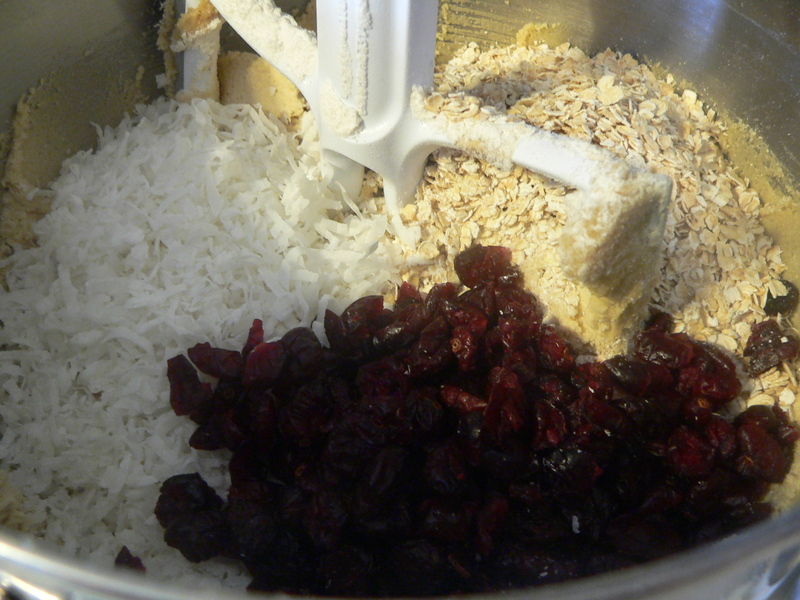 Now for the good stuff…Coconut, Oatmeal and Raisins (however, I substituted Craisins today…no raisins in the house). Mix it all together. The lovely dough...Why bake it??? I love cookie dough! Now scoop it all out onto greased cookie sheets and bake for about 10-12 minutes. I use a stainless steel cookie scoop to get the cookies to be a uniform size and shape. All lined up like little soldiers! Of course, by now the house is smelling heavenly as these start to bake. There is no candle (even at Adrians 🙂 that smells as good as REAL home baked cookies coming out of the oven! All we need now is an icy cold, tall glass of milk. Good thing most of these are going into the freezer for later…it would be hard to stay away from these cookies! I mentioned above how much I love to use my Beater Blade. It is a REPLACEMENT blade for the Kitchen Aid Mixers that continuously scrapes down the sides of the bowl saving you time and frustration. No more pockets of leftover flour in the bottom of the bowl! We carry several different sizes at Adrians, and I would highly recommend them to any of you that are Kitchen Aid owners. 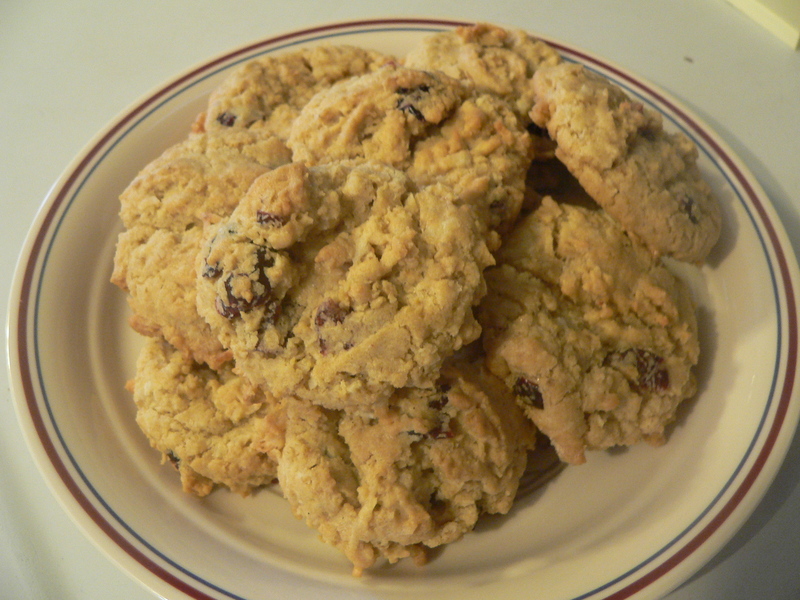 Here is a short demo video showing the Beater Blade making Oatmeal Raisin Cookies. I think you will enjoy watching it! Preheat oven to 350 degrees. 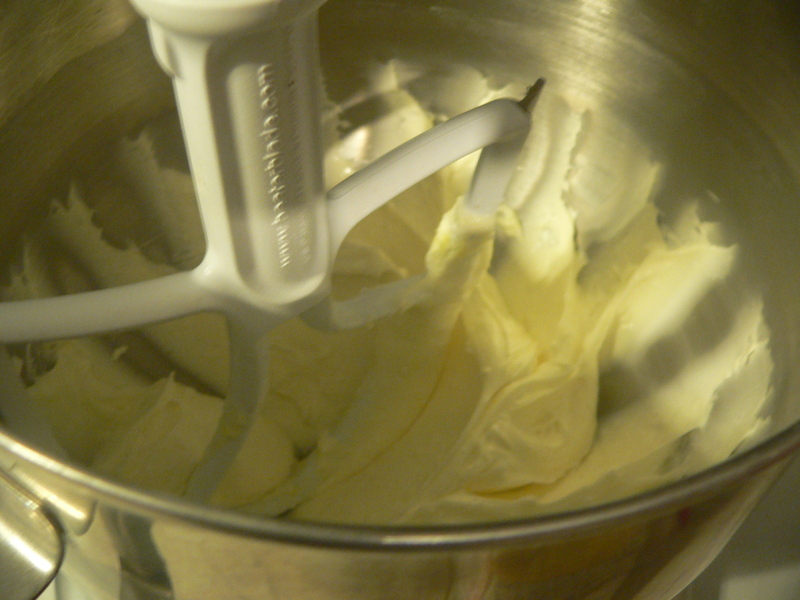 In a large bowl, mix the sugars and shortening and cream well; add eggs and mix well. Add vanilla in hot water; mix in well. Mix all the other ingredients together and slowly add to creamed mixture. 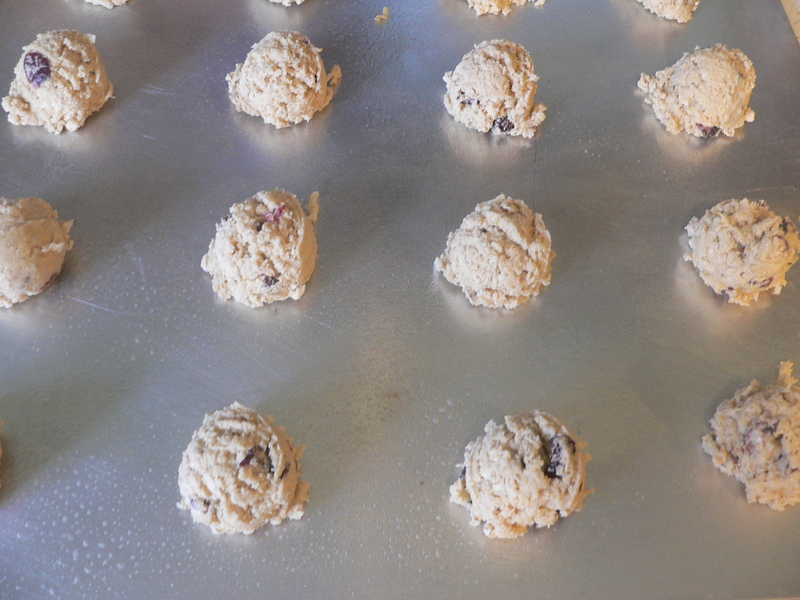 Drop by teaspoonfuls onto cookie sheet and bake at 350 for 10 minutes or until lightly browned. Cool on racks. *NOTE: Linda is an award winning baker and has collected many Blue Ribbons, Grand Champion Ribbons, and honors at the Kansas State Fair over the years. We are thrilled that she was willing to share some of her recipes for our “Between Friends” cookbook. Thanks so much Linda! We love to hear from you! Please leave your comments in the box below.